European Parliament President Martin Schulz has said the new Greek government will seek "common ground" with its European partners as it tries to renegotiate its financial bailout. 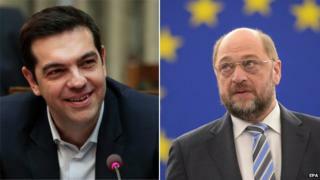 Speaking after meeting Greek PM Alexis Tsipras, Mr Schulz said he expected "robust" discussions on the issue. It comes amid concerns over steps by Mr Tsipras to halt austerity measures following Syriza's election victory. Mr Tsipras has said he wants to renegotiate the terms - but insisted there will be no Greek default, which is feared may push Greece out of the eurozone. Greece has endured tough budget cuts in return for its €240bn (£179bn; $270bn) bailout, negotiated in 2010 with the "troika" - the EU, International Monetary Fund (IMF) and European Central Bank (ECB). Greek bank stocks edged up on Thursday a day after dipping sharply as the government shelved privatisation schemes required under bailout terms. After talks with the Greek PM, the European Parliament president said he expected any discussions to be difficult but that Greece would work with others in Europe. "I found out that the government of Alexis Tsipras doesn't think about acting alone," he said. "It is thinking about making proposals and expects that these proposals will be discussed in a fair and co-operative process to find a solution. I think this is a very good message. I am quite sure that these discussions will be very robust." Earlier he told Germany's Bild newspaper he would encourage the Syriza leader to clamp down on tax evasion in Greece. Meanwhile Germany's vice-chancellor again stressed the need for Greece to respect the terms of its bailout on Thursday. Speaking in the German parliament, Economy Minister Sigmar Gabriel said the new Greek government could not expect the rest of Europe to carry what he called their "burden". "People must respect the democratic decision of voters and a newly-elected government's right to decide its course but the rest of Europe's citizens should not have to expect changes in Greek politics to burden them," he said. Jeroen Dijsselbloem, the president of the Eurogroup club of eurozone finance ministers, will visit Athens on Friday. Ahead of the dignitaries' trips, the president of the European Commission also reiterated his view that cancelling Greece's huge debt was not an option. "Greece must comply with Europe," Jean-Claude Juncker said in an interview with French newspaper Le Figaro on Thursday, stressing that "there is no question of cancelling the debt". "Arrangements are possible, but they will not fundamentally alter what is in place." In his first cabinet meeting since Sunday's election victory, Prime Minister Alexis Tsipras insisted that his country would not default on its debts and vowed to negotiate with creditors over the bailout. The Athens Stock Exchange fell by 9% in response to Mr Tsipras's remarks on Wednesday as it emerged that his Syriza-led government was putting on hold major privatisation projects, including the port of Piraeus and the main power company, the Public Power Corporation of Greece. China, which has a major investment in the port of Piraeus, said it was "highly concerned" by the moves, according to AFP news agency. Greek stocks rebounded on Thursday, with the Athens stock market up 3.2%. Economists estimate that Greece needs to raise about 4.3bn euros in the first quarter of 2015, with Athens possibly having to ask the IMF and eurozone countries. Greece's new coalition government - with the right-wing but equally anti-austerity Greek Independents - was sworn into office on Tuesday.